Ice can form on your windshield in a surprisingly small amount of time. Don’t just depend on your defroster to do all the heavy lifting. Get yourself a quality ice scraper that you can rely on. Remember, plastic is easily breakable, especially in freezing temperatures, so it’s always helpful to have a second ice scraper handy. A chemical windshield de-icer could help here, too. Waiting in the cold for a tow-truck or other emergency services could be deadly if you can’t count on your car for heat. Keeping a blanket and other warm clothing in your car (gloves, an extra jacket, etc.) is essential – you never know how long you’ll be waiting. This may sound confusing at first but kitty litter can actually be used as a great source of traction for your tires. If you get stuck in a bank of snow and can’t seem to get out, try sprinkling kitty litter under and around your tires so that they have something to grab on to. When visibility is low, due to darkness or snow, using road flares allows other drivers to see you. Place them behind or around your vehicle to alert and warn other drivers that you are there. If you don’t want to carry flares or can’t find them, safety road triangles would also do the trick. Keep a flashlight handy so that when you’re working on your car in the dark or figuring out your surroundings, you’re not left without light. Make sure to keep an extra set of batteries around just in case. There are also manually-powered flashlights available so that you don’t need batteries at all. A working set of jumper cables should be a staple of your winter car survival kit. You shouldn’t assume all other drivers will have them – carry them yourself and you’ll never be caught without. You should also be equipped with the knowledge of how to use them. A first aid kit should be in your car regardless of weather conditions. Keep enough items to be able to treat small wounds and other materials such as scissors, safety pins, etc. that could also be of help in a pinch. Even if you never use your first aid kit, just having it with you is better than not having it in a time of need. A lot of us today rely on our GPS systems or phones to get around. While they are convenient, they are useless in the event of a lost signal. Prep yourself for such a situation by keeping a map of the area with you at all times. Also, being able to read the map and map symbols is crucial to being able to use it to find your way out of a sticky situation. If needed, would you be able to change your own tire? It’s important to travel with a spare and even more important to have experience changing a tire so you don’t get stuck in the cold trying to figure it out for the first time. You also don’t want to have to be dependent on someone else to help you – especially if you’re stranded in an unpopulated area. You’ll just need the right tools and a few simple steps to get you back on the road. Here are a few other items to consider adding to your winter car survival kit: poncho, safety vest, zip ties, shovel, snow chains, starting fluid, antifreeze/coolant, tire inflator or patch kit, snacks. 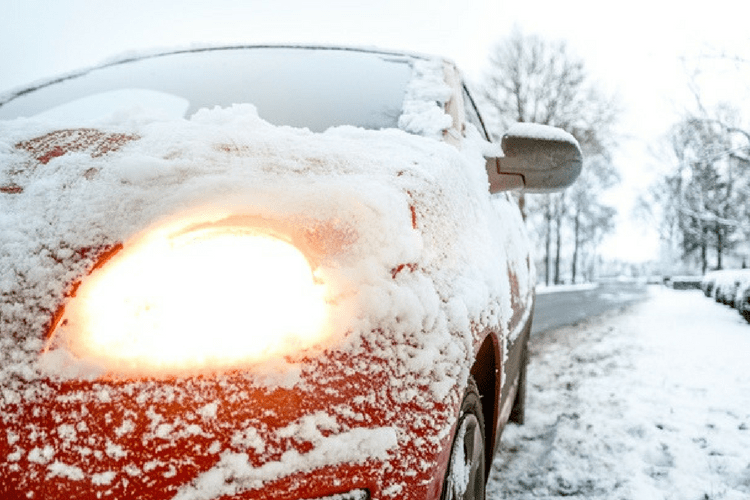 We hope you don’t find yourself needing your winter car survival kit this season but, in case you do, if you follow this checklist you’ll be all set. Always remember to try and situate yourself in the safest area possible if your car breaks down this winter. Stay away from oncoming or passing traffic and be sure that you’re as visible as possible. Remember your local emergency telephone numbers and always perform general car maintenance before taking a long trip. Keep your vehicle filled with more than enough gas to get you where you need to go and keep your car stocked with the above items. This may seem like a lot of items to keep in your vehicle but, you know how the saying goes – it’s better to be safe than sorry. 1) Ice scraper: Buy the very best and they will keep it’s “edge” and be very hard to break. Sharpen the edge every September. 2) Blanket: Get a sleeping bag instead. Or a poly filled bedspread & small pillow. 3) Kitty litter: NO, buy SAFE PAW instead. Safe for pets, melts ice at all temps and adds traction to a surface. 4) Road Flares: Nice but they don’t last that long. Get many. Scared to use flares? Then stay home. Triangles are hard to see in a snow storm, that’s if you’re still along the highway and not in some ditch. A marine flare gun works wonders! 5) Flash light: Use LED’s. BRIGHT. Small enough to keep on your person to keep the batteries WARM. 6) Cables: Use them to start YOUR car. Don’t use them to start other cars. Tell ’em you don’t have any. They can damage your battery when trying to start other cars! 7) First Aid: BURN medications, gauze, tape, staples, large bandages, eye wash, splints, pain meds and a First Aid Kit for your dog, too! 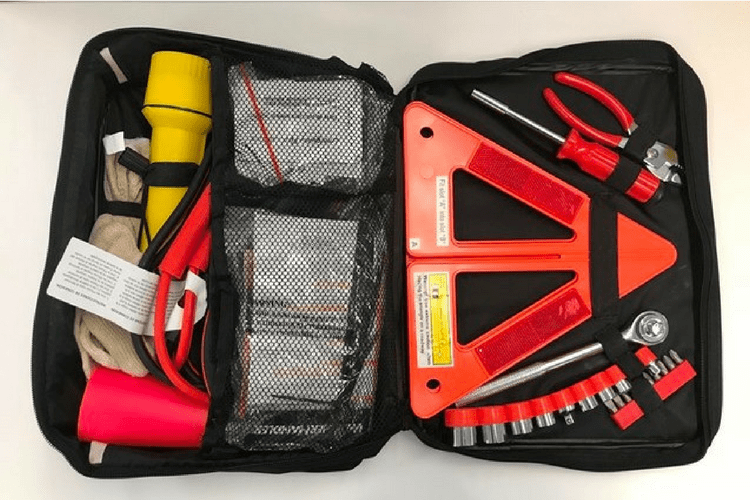 ONE TOOL KIT FOR EACH PERSON IN THE CAR. 8) Maps. Females can’t read maps or drive a 4-speed. GPS, etc.require batteries. MAPS DO NOT! See Flash Light. 9) Spare tire/tools: FULL SIZE TIRE. Practice in JULY, not in January at -20! Pepper Spray – for animals and people. Those donut spares are not good in the winter/ice! NEW spare tire – 100% tread – All Weather. 50-50 anti-freeze, a 2-gallon container of gas, 1 gal WATER/Gatorade, Snack Bars, wool hats, gloves – ND – MATCHES. You might have to start a fire to say warm. A basketball whistle to let others know where you are. Strange that All Season/Snow tires aren’t mentioned. Neither are safe tires with lots of thread left. QUALITY, NOT QUANTITY. Hard things that don’t freeze in the trunk, rest inside the car in a bag that’s strapped to a seat – even these things can fly around inside during a crash and KILL you. Have a travel bag already to do. Toss it in the car and off you go. New Yorkers leave Manhattan at 5pm on Fridays and drive 2 to 4 hours to one of the ski areas. Snow storms never stopped us, not even once! We drive pretty fast and are usually ahead of the snowplows. Gotta go skiing! Keep female drivers off the roads – don’t allow them to drive – you drive! In the winter you can find you and your car way off into the trees or down some steep ravine from just one skid. They might not find you for a day or 2. If yer lucky. If you own a gun, put it in the car, too. Ya never knows. Lots of these things can stay home in the summer. Winter stuff goes in your car starting in November. These are not a lot of things. Get the stuff a little at a time during the summer. MAKE SURE YOUR TIRES HAVE AT LEAST 80% OF THE TREAD LEFT! Tires are cheap. Really. A driving tip in learned in Germany: On an icy road it might take some time to stop. Sliding friction is a lot less than rolling friction. No? Let your car drive along an icy road, then put on the brakes. Started to speed up, huh? Trick: You find yourself slowly sliding into the car stopped ahead of you? Hit the brakes and turn the front wheels all the way to whatever direction you want to do. Let the car slide to almost 20 feet from the car in front – then TAKE THE BRAKES OFF and let the car turn to one side or the other all by itself. Zip, it turns all by itself. Practice on a slippery road or parking lot and you’ll see. Might save a fender bender with YOU at fault from hitting the car ahead of you. Really! Get it down pat and you can brake, slide then zip to one side or another anyplace like turning off street or highway into a parking lot, gas station or whatever. European drivers are SO MUCH BETTER DRIVERS IN ALL WEATHER than 90% of American will ever be. Learn from them.